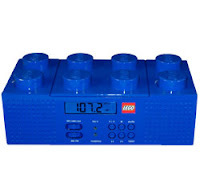 The 80's would have been a very different place if Digital Blue and LEGO had unveiled this bad boy: the LEGO Boombox. The elementary schooler in me is jumping for joy, the adult is wishing this partnership existed when I actually had a boombox in my basement. The LEGO boombox joins the latest electronics line of brick MP3 players and digital cameras expected to be released this summer. Perhaps Radio Raheem might have made it if Sal was faced with a comically oversized LEGO brick instead of a classic silver boombox.